Dr. Subhasree Kar, Associate Professor in the School of Management, CMR University has been a distinguished scholar throughout her career and a popular teacher with seventeen years of academic experience. She is a MBA in Human Resource Management and Marketing Management from Berhampur University, Odisha. She is UGC NET qualified and obtained her doctorate in Business Administration from Utkal University, Bhubaneswar. She secured first class first position in the University merit list in Psychology(Honors) and stood Second in the University merit list in her MBA. Her interest in social studies helped her to obtain a degree in MSW and PGDRD. 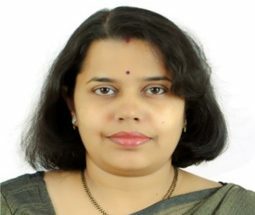 She has taught many courses at PG level and for Executive MBA programs of several Universities at Bhubaneswar as well as in Bangalore .She has been an active researcher; having presented her work in a number of conferences and seminars of repute across the country .Her research papers have appeared in peer reviewed indexed national as well as international journals. She has published two books. One on “Managerial Research Methodology” in 2014 and the other one on “Introduction to Management and Organisational Behaviour “ in 2016 .She has been a reviewer for conferences and journals . She serves as an Editorial member for Sage Open. Her Current areas of interest include Talent Management, Managing knowledge Workers, Work-life Conflict and Employer Branding.